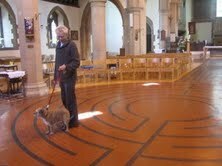 If you have a chance to organise a public labyrinth walk Saturday May 4th at 1 PM, or just get your own self to your local labyrinth (maybe on the finger labyrinth on your desk? ), please do so. Let everyone know about this way of celebrating an international movement for peace and unity.